The sheer panditya that Vedanta Desika embodied and the austerity of his living illustrate the richness of the Bharatiya Jnana Parampara, that even 700 years ago, produced acharyas of the highest spiritual illumination flowing from a spirit of loving surrender and service. On this Shravana nakshatra of the month Bhadrapada, we celebrate the 750th birth anniversary of Sri Vedanta Desika, one of the foremost acharyas in the Srivaishnava Sampradaya and one of the greatest luminaries to have graced this land. Living a hundred and one years, he exemplified the spirit of Sharanagati (surrender unto the Divine), Jnana and Vairagya (detachment). The Indian tradition of smarana, of simultaneous remembrance and reflection, helps us, like the Hamsa, to draw the timeless essence from the contextual lives and actions of great beings. This piece is a humble attempt at grateful reflection on the life of Sri Vedanta Desika.Sri Vedanta Desika was born in 1268 CE as Venkatanatha to Anantasuri and Totaramma of the Vishwamitra gotra fulfilling a divine prophecy that the temple bell of Lord Venkateshwara would incarnate as their son. Thus in the Srivaishnava sampradaya, Vedanta Desika is the Vani of Sriman Narayana, born to clearly proclaim the supreme path of Sharanagati or complete surrender. As a precocious young child, Venkatanatha impressed the learned acharyas of Kanchi with his brilliance. 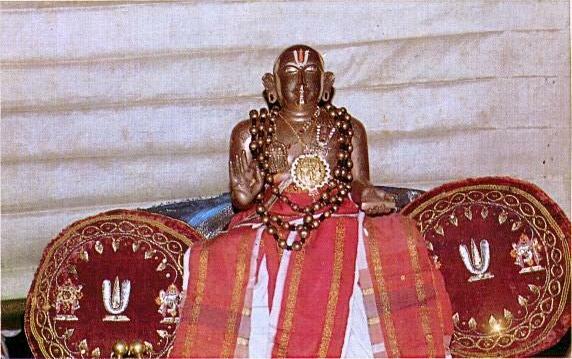 At the age of seven, after upanayana, he began his formal studies under his uncle, the great acharya Atreya Ramanuja. By twenty, he had mastered the Vedas with all the six Vedangas and the 4000 Divya Prabhandasof the 12 Azhwars. As his allegorical passages in Sankalpasuryodaya tell us, he gained a knowledge of his school of Vedanta along with five other vaidika darshanas(schools) – Nyaya, Vaisheshika, Purva Mimamsa, Yoga and Sankhya. 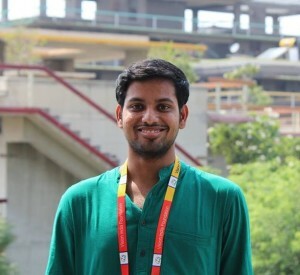 After completing his studies, he entered Grihastashrama by marrying Kanakavalli. The couple took up the rigorous life of Uncha Vritti, living by seeking bhiksha and not storing even grains beyond a single day. For 80 years, Swami Desikan lived this life of austerity.